B U B B L E G A R M: Salt Treatment? Do you ever wish that you were on holiday so that the sun, sea and sand do wonders for your skin? I always do. A few days ago, for unknown reasons - probably because I was ill, experimenting with skin care or just hormonal, I got 2 spots. I didn't want to put any chemicals on it and wanted something fuss free. I usually use honey for spot treatments, but I wasn't in the mood for 'sticky'. I headed for the kitchen, picked up the salt shaker, wet my hand and applied some salt onto it. I then, dabbed the wet salt onto the subject area. I felt some stinging, which immediately made me feel 'Ooo ahh, it's working'. The stinging lasted for a few minutes, and then I just dusted the salt off and let my skin breathe. 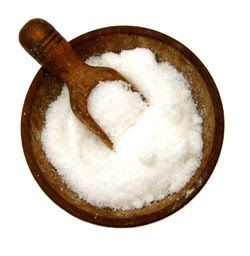 I did some google'ing and came across several topics about using salt in skincare. There were 2 things that jumped out. According to this website Salt (Sodium Chloride) is an astringent and anti-inflammatory. This website states that it softens skin and acts as a detoxifying cleanser that draws impurities out of the body through the skin. If you think about it we are advised to use salt water to rinse our mouths if we get an ulcer to help clear it up, so why shouldn't it work on spots? Using salt water as a toner for your face will probably work wonders. I have only used it for a few days and am liking the effects, one of my spots has almost disappeared and the other is flat as a button but slightly pink. However, after more research I came across an interesting article on Savvy Skin. Jeni, the writer posted a list of skincare ingredients to avoid if you have acne-prone skin. Sodium chloride (salt) is on that list, perhaps things we consider 'natural' remedies are more harmful than they are good? It's a tough one as skin care is SO personal. Personally, I am all for natural ingredients, The best ever skin treatment I have had is definitely sea water which does wonders for my skin, some others include, honey and lemon juice. Our ancestors didn't have a choice of complex skincare products like we do today. Coconut oil is on the list too which seems a little bit crazy. I thought I would pick your brain a little with this post. What are your views? @stephanie I think it's more aimed at your face, but maybe your skins used to it, I'm not sure - what causes spots for one person may not for the other. there's no correct answer. I think that if you are using something that has some of these ingredients and your skin is fine, don't change anything continue using it, but however if you are suffering with acne maybe some of those ingredients could be causing it. Like you said, I think skincare is so personal. I usually take lists like that with the perverbial grain of salt. I also love a natural remedy and have found tea tree oil and asprin applied topically to work wonders for blemishes that pop up. Taking a zinc vitamin everyday has also helped my complexion tremendously! @Stephie most certinly! tea tree oil is great, I used to take zinc tablets but cut everything out. Thanks for your response. @Belledujour excellent, I usually mix sugar with olive oil to exfoliate but I bet salt feels great! Considering sea water heals so many ailments im surpised its on a list of bad things. I guess they may feel its abraisive if used too strongly. Muhsine, you are right to say that it completely depends on the individual. My sis loves dead sea products, but I find any product with salt stings me too much. I prefer sugar-based scrubs, a lot of things depend on a person's internal chemistry. I want to go with more natural skin/hair care. Has anybody else noticed that when spots clear in one place, they suddenly appear somewhere else. It is only ever two or three but my body never totally clear. It is like if I start to use new product on one part of my body then the other part protests, not fair we want expensive/new/special product too! I think salt can be good for our skin. I definitely support the idea of using it as a body exfoliator and I also know that you can use it on your face as long as it's fine salt and not crystals :) Plus you can mix salt and essential oils and use it on problem cellulite areas, which often helps to reduce the orange skin effect. The only thing I need to mention is that the salt needs to be the sea salt kind, not the table salt because they add anti-caking ingredients to it and it doesn't really contain any minerals. It's sort of like table white sugar, it's stripped from everything and too high in sodium and too low in potassium. At the same time sea salt (you can always find it in supermarkets) does contain traces of minerals and is slightly lower in sodium. This is the one to use. Salt can dry skin out, so it's important not to use it on dry or sensitive skin. essjay23x, have you spoken to your doctor? It may be more than just spots. I once was breaking out all over my legs, the doctor told me it was a bacteria, gave me a pill that cleared it up in less than a month. A friend of mine had to take accutane to clear her skin cause nothing else worked. It dried out her skin, but she used a product called spectro gel which seemed to help. Another pricy but EXCELLENT product is decleor. My sister bought two or three bottles from ebay, finished the regimen, than started using body shop's less expensive tea tree oil collection, her skin has been clear since. Muhsine, thanks for this post, you got my brain turning with ideas for a post! Great post, most of the times when my exfoliator is finishes I use salt or sugar to exfoliate my face and I love it!By the way I order some lush soaps because of you!!! !I wanted to try Honey I washed the kids so much ever since you said you love it so much!!! Great idea - I'm going to try out the salt as spot remedy idea. Sounds good as it's such a natural product.